Discovering Vietnam will take you all to an unforgettable travel experience through peaceful city of Ha Noi, wonderful coastline of Ha Long, imperial citadel of Hue, decent township of Hoi An, bustling metropolis of Ho Chi Minh City and mighty waterworld of Mekong Delta. 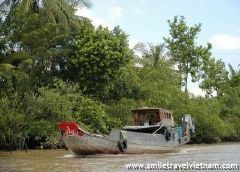 Welcome onboard and we would start off excellent relaxation tour from the north via central to the south of Vietnam within the pace of half month long. Guests would enjoy great opportunities to leave out all the stress in stunning landscapes and backing to work and lives in such a good mood than ever before. Our team would meet you all at Noi Bai International Airport then transferring to the reserved hotel in the downtown of Ha Noi. After time of check in and resting, we would set off initial city tour to Temple of Literature, Hoa Lo Prison and Quan Thanh Temple. Getting back to the hotel for tour briefing, dinner and accommodation..
After having breakfast at the hotel, we would come to visit Ho Chi Minh Mausoleum, Ho Chi Minh Residence, One Pillar Pagoda and Army Museum before having lunch served at local restaurant. Afterwards, we would drive 180 kilometers to the east, reaching Ha Long City and overnight there. In the morning we would take a cruising trip around picturesque bay of over 3,000 limestone islands and having seafood lunch onboard. In the afternoon we would row back to the Ha Long Tourist Wharf, checking out and return to Ha Noi Capital in the same day. Having dinner and staying overnight in Ha Noi. Finishing breakfast at the hotel, we would join in vocational villages around Ha Noi. The first stopover is traditional carpentry village of Dong Ky in Bac Ninh Province. Afterwards, we would continue to Dong Ho Village which is homing to famous painting naive pictures. Then we would drive back to Gia Lam District to visit pottery village of Bat Trang and having lunch served there. In the afternoon, we could take time to stroll around Hoan Kiem Lake, Ngoc Son Temple and ancient streets of Old Quarter. In the evening, we would catch the night train to Hue. Overnight on train. We would arrive at Hue around 09:30 in the morning. 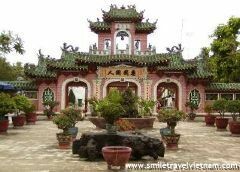 After that we would take a drive to visit Tu Duc and Khai Dinh Tombs before having lunch served in a nice restaurant. 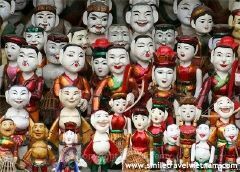 We would check in hotel and relax for a period of time before cruising along Perfume River to visit Thien Mu Pagoda and Imperial Citadel. Backing to the hotel and overnight in Hue. After having breakfast at the hotel, we would drive through Hai Van Pass, pretty red tiled villages and abundance fruit orchards and spectacular coastline to reach Da Nang City. 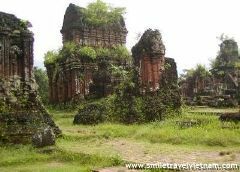 We would come to visit Cham Museum, Marble Mountains and Beach before heading out to Hoi An where we would have dinner and night rest. Guests could enjoy free at leisure before hoping on minibus depart to Da Nang railway station. On arrival we would catch the day train to Nha Trang. In the same day, we would reach the coastal city of Nha Trang, checking – in the hotel and staying overnight there. 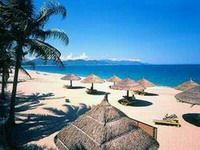 Aspiring to offer guests an ideal relaxation on beaches, in three coming days would be entirely spent in beautiful city of Nha Trang. Besides participating wide ranges of sea sports such as swimming, scuba diving or snorkeling, holiday makers could join in cultural exploration through excursions to Long Son Pagoda, Ponagar Cham Tower and local market. Alternative could probably be refreshing in massages and body care services in professional spa. 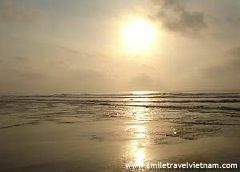 Today we would head out to Mui Ne, another paradise of sandy beaches, dunes and luxurious hotels and resorts. For hours on transfer minibus, through beautiful settings of villages, sea and forests we reach targeted in the same day. We would immediately check in hotel and spending the rest of daytime on relaxation. 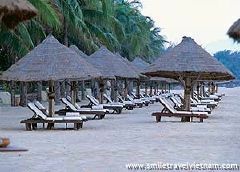 We can not miss a second to pamper in wonderful environment in Mui Ne. With the sun shine all day long, guests could lie sunbathing on sandy beaches, or take incredible pictures of beautiful sand dunes which could reflecting the lights of sunrise and sunset. Nothing could make you feel relaxed and peaceful in minds than wondering along wavy valleys of white and red sand dunes lined with green trees and surrounded with high mountain and deep blue sea. Backing to the hotel for dinner and accommodation. 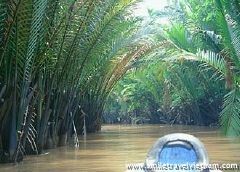 In the morning we would drive to Ho Chi Minh City, having lunch there and continue to Cu Chi Tunnel. Upon arrival guests could roam around tranquil land which used to be shield against horrific warfare with hundreds meters of tunnel network. 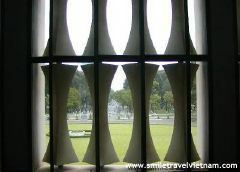 Passengers could creep underground to understand how Vietnamese lived and fought during the recent past. 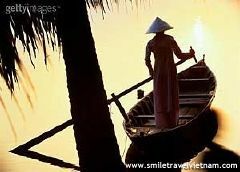 Backing to Ho Chi Minh City at the sunset time, checking in hotel then enjoying dinner and night rest. Today guests are offered two choices to make up exploration. 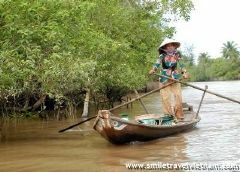 The first option is driving to My Tho Province which is famous for extensive orchards and immense rice feels as well outstanding for rural lives of sincere southerners in Mekong Delta. We would embark on boating trip and navigate through delimited system of intricate rivers for first hand experience of river lives. 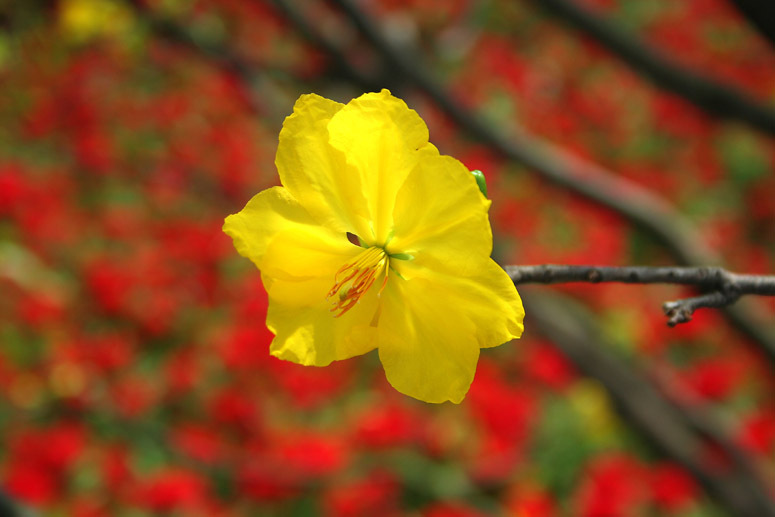 The second one is hopping on pickup car to visit Tay Ninh Province. 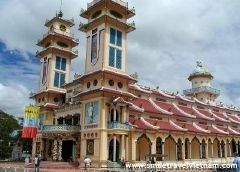 This is home to Cao Dai Religion which attempts to make a synthesis of teachings of Buddhism, Christianity, Taoism and Confucianism. Two selected program would serve lunch on the road and backing to the Ho Chi Minh City in the same day. There is leisure time for all guests to stroll around bustling shopping malls before getting to transfer minivan to Tan Son Nhat International Airport.